Many high school students in Atlanta do not know their potential to achieve great things. Lack of exposure to experiences that inspire interest in particular subjects or careers limit their perceived choices for their future. Georgia Department of Labor reports that while the unemployment rate among adults is currently 4.7%, the Georgia Youth Unemployment rate is projected to be at 25% by the year 2020, according to Trading Economics econometric models. At the same time a rapidly increasing shortage of skilled and talented laborers is expected to impact industries ability to grow and create more jobs. The Georgia Tech Atlanta PIPELINE Project serves as a catalyst for cultivating innovative industry-based training opportunities for high school students through apprenticeships. The PIPELINE Project partners with Purpose Built Schools, an Atlanta based non-profit committed to breaking the cycle of poverty through high performing schools, and leading companies in the Atlanta area to facilitate internships and apprenticeships for high school students. Based on the German dual education model, students are in school, earn income, and acquire valuable industry recognized academic and work competencies needed to excel in their careers. This approach is a win for industry because they gain loyal, skilled employees that are ready to contribute on day one. Phase One of this project is funded by Purpose Built schools and includes the solicitation of Industry partners and the obtainment of approximately 30 internship/apprenticeship slots for the high school students. Phase One is scheduled to be complete no later than February 28th. Phase two of the project includes the critically important training, oversight, implementation and evaluation of the student placement experience. Industry partners have stepped up to the plate. Students have yet to be introduced to their menu of career pathway opportunities. The nature and tone of this introduction is key. Something powerful is about to take place in their lives and the impact of this experience depends on the flawless implementation and executional steps taken during phase two. Instructional staff are the key partners in this initiative. When there is clear alignment and consensus with the faculty, the student assembly will take place. The Student assembly will be interactive, inspirational and aspirational. Students will see opportunity in participation. There will be Q&A and the event will end with an enrollment/indication of interest opportunity. The CEISMC team will present the industry opportunities to interested students. Students will apply for up to three positions. Students will be matched with possible positions—companies may interview and select. Schedules will be designed in consultation with instructional staff, guidance counselors, industry partners, students and parents. Training will be created for summer and fall cohorts to be delivered before Memorial Day. Resources include CEISMC, Alliance, GTRI and others. GT Mentors will be assigned to a Student Employee. (SE) Industry specific training will occur during training week. Transportation will be designed to serve students and industry partners. Student Employees will begin summer program June 4th. Training for Fall Semester cohort will occur before school begins, either as a refresher or as the initial training. GT mentors will stay in touch with industry partners. 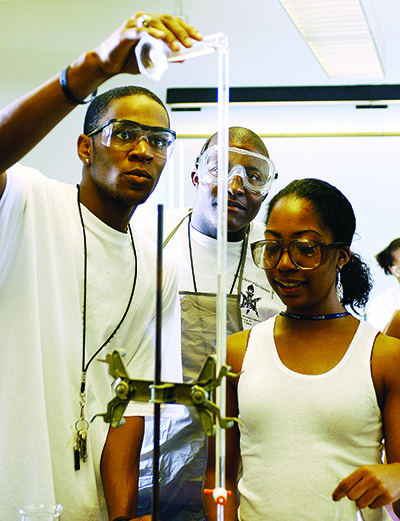 The PIPELINE Project is designed to be a pilot program using the Purpose Built high schools in the Drew and Carver Clusters to shine a light on the power and value of connecting under-served youth while still in high school with industry partners to transform their potential on the education to work continuum.